Lovely, just lovely, this antique cumberbund or lady’s belt sash. Dates from the late Victorian or Edwardian era. 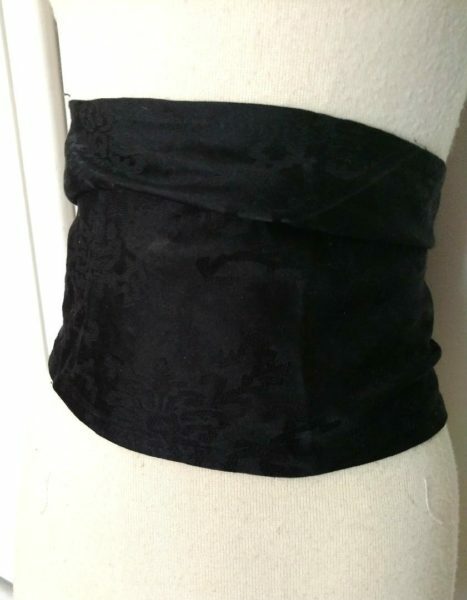 Suitable for Gothic, Steampunk or period costuming. Home sewn, the cumberbund is made of black silk damask fabric, shirred and boned at both ends. Three gorgeous hand made rosettes, of the same fabric, decorate the one side. Hook and eye closures fasten the sash.